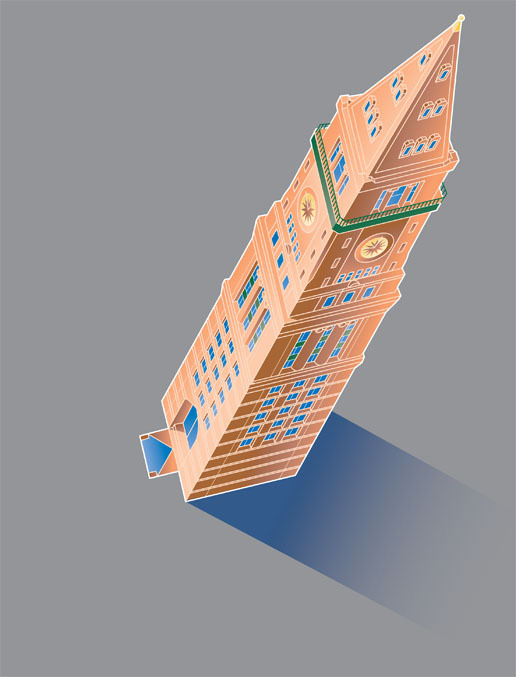 Randal Birkey created this Adobe Illustrator vector-based illustration of a high-rise tower building for use on the cover of a MetLife Asset Transfer Kit, through a New York City ad agency. This style of architectural illustration is called an axonometric. The footprint of the building is drawn to scale and proportion (width and depth). The third dimension (height) is created by popping up off the footprint at a consistent angle, all of the vertical elements. There are no perspective or foreshortened lines in the illustration, yet it delivers a 3D aerial perspective visual sense to the viewer. This copyrighted work was done in 1995.